A little less than a year ago, I wrote about my success losing weight by spending an hour each morning playing Dance Dance Revolution. However, after nearly a year of this regime, I grew bored and felt the need for a change—so I decided to try watching anime on an exercise bike instead. A little background on me: Growing up, I was one of those kids who could eat as much as they want of anything they want and remain thin as a rail. However, even then, I knew it couldn't last; so I made myself a deal: When my metabolism slowed down and I started to put on the pounds, I'd start watching my diet and exercising. One problem, though. I hate exercise—with a passion—and it’s hard to be motivated to wake up early and do something you hate. Thus, I had to make exercise fun somehow—hence the idea of using DDR as a weight loss method. Last year I wrote a bit on how it was working, but I never did quite get the results I was hoping for. And by about November of last year, DDR had become unbearably boring. So I set upon a new idea: watching anime each morning while riding an exercise bike—not the most original idea, I admit. I started by buying the incredibly inexpensive ALINCO AFB4409 off of Amazon for $150. 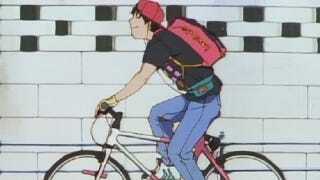 Then, all that was left was to watch two episodes of anime (44 to 46 minutes total) each morning as I peddled. I kept a day-to-day record of how many calories I burned (according to the bike's calorie counter) and tried to “beat my score” from the previous day each morning. Now, four months later, I tend to burn between 900 and 1000 calories each ride. And thanks to the anime, I am totally distracted whenever I work out and don't even notice it. Best of all, I have lost ten pounds (leaving me at 157 lbs total), bringing me down to the “normal” BMI weight range for the first time in seven years. However, I'd be lying if I said exercise alone was responsible for my weight loss. After a stupidly embarrassing moment where I discovered that I had been eating far more calories than I thought I was—i.e., ridiculously small serving size calories versus amount of calories in a whole package—I fixed my diet so that I take in no more than 2000 calories a day. This means I basically go shopping with a calculator in hand. I also work to avoid carbs (namely rice and bread) whenever I can—though that is pretty difficult as bread is easily my favorite food. I've also learned two very helpful dieting tips for a single person like me: (1) Super low calorie food like yogurts and salads are your best friends and (2) never buy in bulk. If you are like me, you'll eat everything you can if it's put in front of you or is available just a few steps away, so buying only what you plan to eat for your next meal makes it impossible to overeat. However, even with all this, I know I could be eating healthier. Unfortunately, I grew up with a father who is an excellent cook and thus never bothered to learn much beyond the basics of cooking myself—seriously, why would I want to eat my crappy food when I could eat his delicious spreads. Moreover, I don't enjoy the act of cooking and find it a waste of my free time. However, despite this shortcoming, my weight loss plan has been a big success. After about 15 months, between DDR and this, I have lost 20 lbs total. And let me say, there is nothing more satisfying than trying to tighten your belt only to find there are no more holes and you need to buy a smaller one.